Every year, millions of students graduate from primary school, middle school and universities. Graduation is always a mixed blessing. We're happy, because we have made achievements after years' efforts; we're disappointed, because graduation means it's time to say goodbye to our best friends, respectable teachers and beautiful campus. They are memorable things worthy of treasuring forever. And the best idea is to take photos and make an impressive slideshow. Pictures are always scattered in our computer, phones, tablets or cameras. Consequently, they're difficult to manage and vulnerable to be missing. However, graduation slideshow is not only easy to control, but also displays vivid video slideshow with fair-sounding graduation songs. So, it's high time to learn how to make graduation slideshow on Mac and PC with easy-to-use photo slideshow maker. How to Make Graduation Slideshow on Mac/PC? Convert pictures into a slideshow with music on Mac/PC. The best graduation slideshow maker should be simple, easy-to-use for students, teachers, parents, namely, any one. 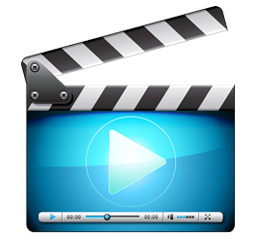 And WinX HD Video Converter for Mac and WinX HD Video Converter Deluxe (for Windows) provide the best easy-to-use graduation slideshow making solution for Mac and PC. The built-in photo slideshow makers help to create a high-quality graduation slideshow with great graduation songs in a few simple steps. Everyone can create an awesome graduation slideshow using the above mentioned slideshow makers. Here we will show you how to make graduation slideshow on Mac computer as an example. To make graduation slideshow on PC, you can also refer to this guide, because the steps are almost the same. Before making graduation slideshow on Mac, you're required to put the photos in a folder and find the music that you want to embed as background music of the graduation slideshow. If you don't have any idea about graduation songs, there's a post about the good graduation songs list and free download tips. And then free download the slideshow creator on Mac. It is fully compatible with macOS Mojave and lower. Next, install and launch it to carry out the following steps. Step 1. Load photos by dragging photo folder to the main window. Step 2. Select output profile for your graduation slideshow. Output profiles have reached to 410. 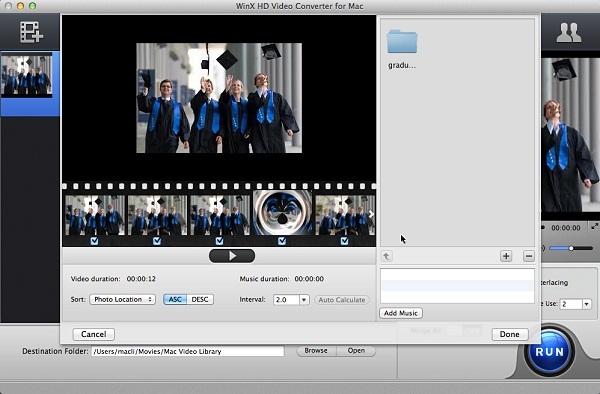 You can make the graduation slideshow fit for Mac/PC (MOV, M4V, MP4, AVI, WMV, etc. 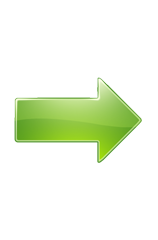 ), popular mobiles (iPhone, iPad, Apple TV, Android, Sony, Microsoft, etc. ), software (iDVD, iMovie, Final Cut Pro,), or online video-sharing center, like YouTube. Step 3. Edit graduation slideshow. You're permitted to sort photo order, set interval time, choose display effect for every image and add background music. If you attempt to add more photos along the way, just click "+" to insert another photo folder. Step 4. Hit "RUN" to begin graduation video slideshow making. As you can see, both WinX HD Video Converter for Mac and WinX HD Video Converter Deluxe are qualified slideshow makers. Not only can you make graduation slideshow, but also make flash slideshows for your unforgettable travel, ceremonies, wedding, activities, etc. Indeed, photo slideshow making isn't the unique feature. They're also experts in converting videos even those with 4K/8K resolution, editing videos, and downloading and converting YouTube videos. Graduation songs can be free downloaded from YouTube easily with the help of WinX HD Video Converter for Mac and WinX HD Video Converter Deluxe. Besides sharing graduation slideshow via email, or uploading to YouTube, Facebook, you can also burn your graduation slideshow to DVD using a third-party DVD author. And WinX DVD Author is a piece of free yet powerful DVD authoring software. You can burn your slideshow video to DVD with DVD chapter menu & subtitle with incomparable video audio effect. Moreover, it's a pretty good idea to download the graduation slideshows uploaded online by your friends and burn to DVD for cherishing, by using WinX DVD Author. One day, classmates and teachers must be deeply moved in a reunion party when you take out the DVDs recording your precious past. Want to convert your self-made graduation slideshow video to play on iPhone, iPad, Android phones/tablets? WinX HD Video Converter for Mac is also available!